We're committed to providing students with the opportunity to make learning work with their busy lives. To fulfill this goal, we offer programs in a variety of flexible formats: full-time and part-time enrollment, evening and weekend courses, and most recently, online learning options. Georgetown University’s authorization to admit online students in many states is pursuant to its membership in the National Council for State Authorization Reciprocity Agreements (NC-SARA). Please visit the NC-SARA website for a list of current SARA member states. We make every effort to keep these lists up to date; however, your admissions advisor or enrollment management team will have the most current information on online admissions from states or countries outside the District of Columbia. Visa support is currently unavailable. Immigration support is currently available through Georgetown University for international students to apply for U.S. student visas for the U.S.-based residencies. Students living outside the U.S., including U.S. citizens, may not be able to complete an internship or field experience. Students living outside the U.S. may apply for these programs, but may not be able to select elective courses that involve an internship or field experience. Prospective students should contact their admissions advisor to discuss how this policy applies to their situation if they are interested in completing an internship, while current students should contact their program administrator. Please be aware that students who relocate while enrolled at Georgetown University may experience a delay in registration eligibility or potentially be unable to complete their studies if they are moving to a country or state where Georgetown is not currently authorized to offer an online option for a particular program. Prospective students should contact their admissions advisor to discuss how relocation could alter their eligibility, while current students should contact their program administrator if they are considering relocating during their course of study. Degrees conferred by Georgetown University are recognized in the United States and may be recognized in other countries. Degrees and certificates conferred by Georgetown University are not officially recognized by Mexico. All international students are encouraged to research the policies pertaining to degree recognition in their home country prior to enrolling in a Georgetown program. None of the online master's programs offered through the School of Continuing Studies provide any professional licensure or certification. Though not required, students in these programs may wish to research and seek certifications through professional organizations in their field. SCS online programs use some or all of the platforms listed on this page. Students should confirm that they have a reliable internet connection and the ability to access each of these platforms before applying. While every effort is made to ensure course content and materials can be accessed by all students, it is not guaranteed. A variety of circumstances may affect the ability to access course content and materials, including internet access issues, firewalls, and hardware limitations. Students who are unable to access course content and materials will not be able to complete the program, and will receive a refund consistent with Georgetown’s refund policy. Additional information for distance education students at Georgetown University is available through the Office of Compliance and Ethics. Specific refund policies have been developed for our online format. The current refund schedule can be found on our Academic Calendar. Please see our How to Apply page for information on the application process. Georgetown University is authorized by the Washington Student Achievement Council and meets the requirements and minimum educational standards established for degree-granting institutions under the Degree-Granting Institutions Act. This authorization is subject to periodic review and authorizes Georgetown University to offer specific degree programs. The Council may be contacted for a list of currently authorized programs. Authorization by the Council does not carry with it an endorsement by the Council of the institution or its programs. Any person desiring information about the requirements of the act or the applicability of those requirements to the institution may contact the Council at P.O. Box 43430, Olympia, WA 98504-3430 or by email at degreeauthorization@wsac.wa.gov. 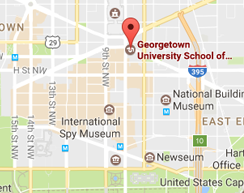 The transferability of credits earned at Georgetown University is at the discretion of the receiving college, university, or other educational institution. Students considering transferring to any institution should not assume that credits earned in any program of study at Georgetown University will be accepted by the receiving institution. Similarly, the ability of a degree, certificate, diploma, or other academic credential earned at Georgetown University to satisfy an admission requirement of another institution is at the discretion of the receiving institution. Accreditation does not guarantee credentials or credits earned at Georgetown University will be accepted by or transferred to another institution. To minimize the risk of having to repeat coursework, students should contact the receiving institution in advance for evaluation and determination of transferability of credits and/or acceptability of degrees, diplomas, or certificates earned.